This is my first preview on here, and I do hope it is up to scratch!!! established a footballing side to keep the team together and fit during the winter months. They played their first match against The Mechanics on 19 October the same year. In 1882 the cricket and football clubs parted company; the cricket club ceased to exist in 1925. The football club turned professional in 1887 after pressure from players threatening to defect to other clubs. 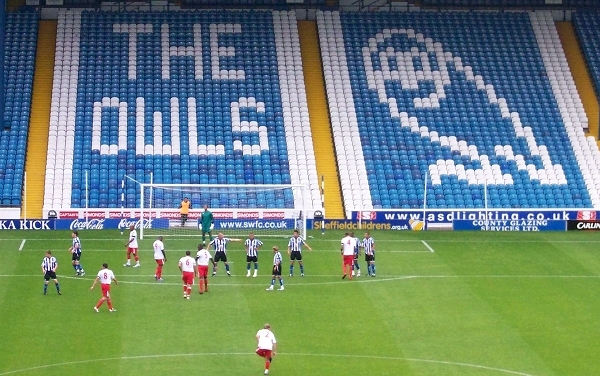 Sheffield Wednesday won their first game as a professional club against The Mechanics 3–0. The move to professionalism took the club from Bramall Lane, which had taken a share of the ticket revenue, to the new Olive Grove. And their opponents in their first game at their new home? None other than Blackburn Rovers!! Due to an expansion of the local railway lines, the club were told that they would have to find a new ground for the 1899–1900 season. After a difficult search the club finally bought some land in the village of Owlerton (which would later lead to the nickname ‘The Owls’), which at the time was several miles outside the Sheffield city boundaries. Construction of a new stadium (now known as Hillsborough Stadium) was completed within months and the club was secured for the next century. The club was formerly known as "The Wednesday Football Club" until 1929, when the club was officially renamed "Sheffield Wednesday Football Club”. At the start of the 20th century, when a player presented them with an owl mascot to honour their stadium at Owlerton, adjacent to Hillsborough the club became known as "The Owls"
Since 1899, the club has been at its current home of Hillsborough. This is the largest stadium in The Championship with a capacity of 39,812, and indeed the largest stadium outside of the Premiership. The club do have a large support, owing to their favourable catchment area, with the majority of supporters coming from Sheffield, South Yorkshire, North Derbyshire and North Nottinghamshire. This is reflected in the average attendance being the second highest in The Championship this season of 23,347, and their highest gate of the season so far being 28,582. For the final game of the League One Season last season, they had an attendance of 38,082 (where they ended up winning promotion at the expense of their City Rivals United). Also, in the League One Play-Off final of the 2004-2005 season, they took 42,000 fans to The Millennium Stadium. Hillsborough has hosted matches in 1966 World Cup, at Euro 96, and also 27 FA Cup Semi-Finals have been held at the stadium. The Kop at Hillsborough was re-opened in 1986 by Queen Elizabeth II and was once the largest covered stand of any football stadium in Europe. Well, we both play in Blue and White..... As mentioned above; we played them in their first game at their original Olive Grove Stadium, and both clubs are founder members of the Premier League. So, I’m sure we can all agree (for a change), some of the above, made a much bigger impact for Rovers than others!! CN1874 has helped me out with this via a friend Seamus, so extended thanks to them!! Following promotion to The Championship, has this season turned out as you’d hoped? consolidation; but we would have liked to be safe by now! Rovers fans have had the double indignity of having their club made a laughing stock AND being criticised by the Sky Sports Suit Potatoes or protesting about it. Venky’s have this cartoon villain / Chris Morris mockumentary kind of evil ineptitude thing going on which obviously makes your club quite hard to support. Conversely, what are your feelings towards Milan Mandaric, as he’s been known to be trigger happy with managers? And your manager Dave Jones, is he any good? understand, but he wants the club to be self sufficient, which is definitely the best thing for our long term future. Dave Jones has had an up and down time with us so far. His appointment was controversial. Megson wouldn't have got us promoted. We were in the play offs and in very poor form - we beat Sheffield United and Megson was sacked 3 days later. There are still sections of our fan base who hold this against Jones - they are idiots. We've struggled at parts this season. Megson signed ageing, dependable pros - all of whom couldn't make the step up to the Championship. We don't have a lot of money to spend so we have had to make a lot of gambles in the transfer market - this means that quite a few of Jones' signings haven't worked out. I still genuinely think that Jones is the best manager we've had in a long time - it took him a while to work out how to get us winning this season, but he's developed a system and we have been punching well above our weight ever since. The team is far greater than the sum of its parts and I think that is the sign of a good manager. Who should we look out for in your squad? Our most dangerous player is Michail Antonio - he is our top assistor and scorer but he's injured. Réda Johnson is a cult hero. He has no right to be a professional footballer: giant and cumbersome, awful technique but has a goal to game ratio of 1 to 3 FROM LEFT BACK! He's a huge danger from set pieces. We also have Antony Gardener and Chris Kirkland who were signed on free transfers and have been exemplary - very consistent. In turn, is there anyone in the Rovers squad you would have in the Wednesday team? Jordan Rhodes. We know him quite well: he scored 4 against us in a 4-4 thriller last season. The fact that you signed him for the amount of money you did makes it crazy that we are in touching distance of you in the league! Good luck next weekend! If we win then you are in the brown stuff. Not sure whether you'll survive if we do. It's a difficult one to predict with your situation and us having lost Antonio. I think that it would speak volumes about the state of modern football if you and Wolves went down - it might be required to make a point! At Hillsborough we haven’t done so well historically, with Wednesday winning 35 out of the 64 meetings there, 13 Rovers wins, and 16 draws. Overall, things have been quite a bit more even, 48 Rovers wins, 52 Wednesday wins, and 32 draws. The last time the two clubs met at Hillsborough in the 2000/2001 season, when the clubs drew 1-1, with a goal from their current captain Martin Taylor. Though we did end up promoted at the end of that season! We did manage to get the better of them earlier in the season, thanks to a 5th minute Grant Hanley goal, and we ended up winning 1-0. Wednesday are currently 8th in the division's form table, with 3 wins from their last 6, obviously winning last time out against local rivals Barnsley. We're a perilous 22nd in the same form table, drawing against Blackpool in our last game. I hate trying to guess what Rovers will do in any game, so I’ll sit on the fence and guess at 1-1.